The Crafty Nurse here today with one cat crazy card! I started by stamping each of the “Crazy Cat’s” onto my card front. They were done in Archival Inks in Sepia, Black Soot, & Hickory Smoke. I then masked all three of the cats and placed the Art Anthology Stencil called “Cracked” over top and stenciled in using Vintage Photo Distress Inks. 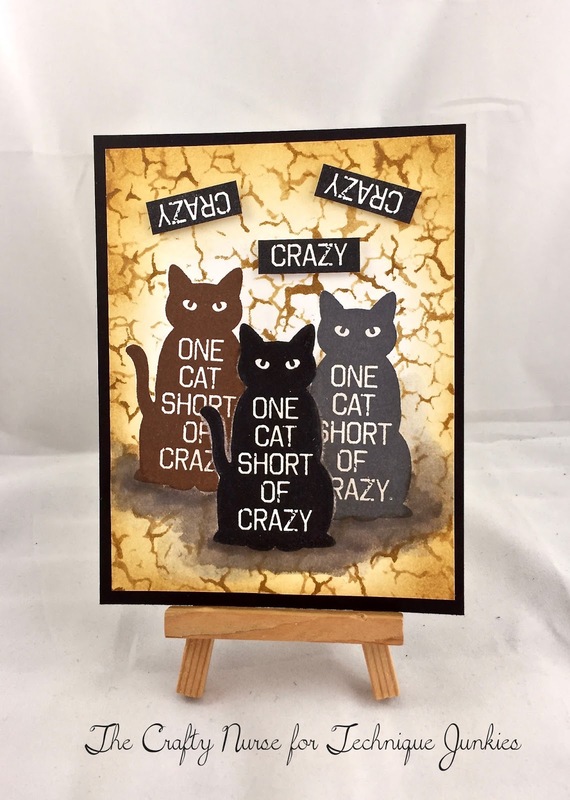 I stamped off 3 more of the black cats and then cut out the word “crazy” which I used as my sentiment. To finish off I created a ground for my kitties to sit on with watercolored distress inks and finished off with more distressing on the edges. I’ve also entered this card in the Mixed Media Stencil challenge using the Art Anthology Cracked Stencil. For those crazy cat lovers and stampers alike, I hope you’ve found a little inspiration today and look forward to seeing what you do with your new Technique Junkies stamps. It’s The Crafty Nurse here with a bit of inspiration featuring one of the January Release stamps from Technique Junkies called “Messy Love #S744”. I wanted to use this stamp in a masculine way by using muted colors and a simple design. 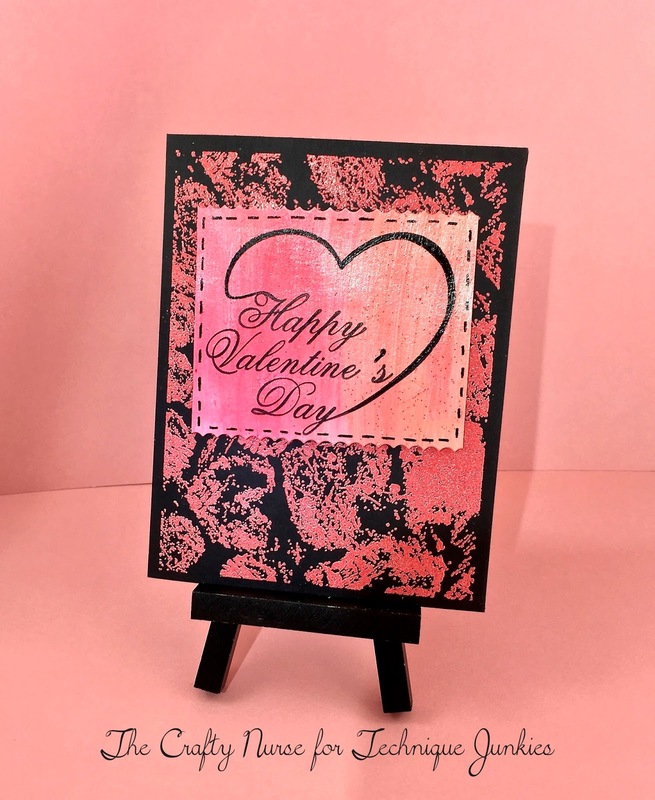 I began by stamping “Messy Love” with versamark ink over some MyMinds Eye design paper then clear heat embossed the heart pattern over the design paper. Once heat set, I then took Distress Ink in Ground Espresso and went over the entire piece buffing with a baby wipe to remove any lingering ink over the clear embossing. There is a similar technique in the Artistic Effects CD using Distress Stains. I finished off with the “Forever and A Day” stamp set from last years release. We all need some masculine love cards this time of year so try out this cool technique with some of your favorite Technique Junkie Love stamps.